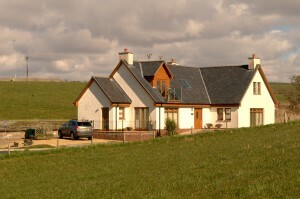 Surrounded by farmland on the hill overlooking the village of Glenluce you really will feel away from it all when you’re “Up Yonder.” The property is two minutes walk from all the village’s amenities and yet feels like in the heart of the countryside. Inside are spacious living areas and bedrooms with all mod cons, finished throughout with warm solid oak flooring. Outside, both the raised patio and balcony offer spectacular views of Luce Bay and the Mull of Galloway, Scotland’s most southerly point. Disabled access is by means of a ramp from the paved parking area to the front door. Glenluce provides an ideal base for visiting Dumfries and Galloway, Wigtownshire and Northern Ireland. There are numerous beaches, The Mull of Galloway visitor attractions, picturesque Portpatrick and various country houses.